We can make your life a little easier if you don't have the time to learn to do a traditional bun. Well, to be fair the traditional wig we usually think of wasn't something you could put together yourself. The hair was arranged by a hair stylist and ladies would carefully lay their heads on hard, curved pillows so that they wouldn't mess the elaborate yet simple design. Yeah, that's going to be a tricky style to copy on a whim. We don't expect you to sacrifice your beauty sleep for this chic and dignified look. This traditional Japanese Wig will speed up the process of making you into a respected entertainer. Then all you will have to learn is how to properly put on a kimono. 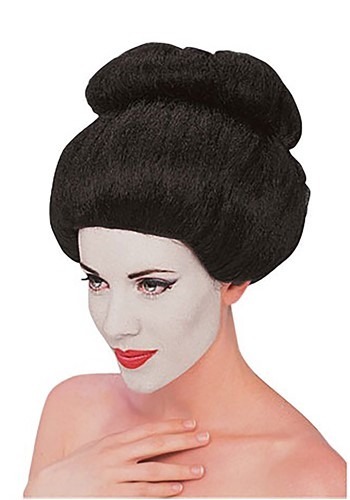 You will look beautiful while wearing this wig and you'll have more time to practice before you play the shamisen for guests. It's perfect for anyone trying to create a costume inspired by traditional Japanese looks. Very disappointed with this wig. It was way too small for my head. Mind you, my head is not big at all.. when I tried it on, I thought I got the wrong one or a kids size, but no, it was for an adult. Now I have to return it and get another one somewhere else. The wig is too small. Thought maybe I ordered a children's size. Don't think I will be able to use it. Very disappointing. Child's wig masquerading as adult wig. We bought this for my wife and she couldn't even get it partially on her head it was so small. We ended up using it for our 19 month old daughter because it fit her better. If you have a normal size head don't even try with this one. Like this wig. Packaged well. Only negative was it came with a pink bow attached that is not pictured here.